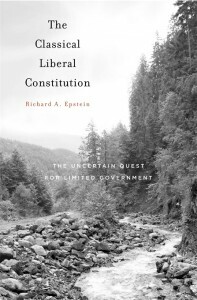 Written over seven years, The Classical Liberal Constitution is—says Richard Epstein, Laurence A. Tisch Professor of Law—a “lifetime summation.” Harvard University Press published his book last week, and on December 12, Epstein visited the Cato Institute, the Washington, DC-based libertarian think tank, where he discussed this achievement. In his book, Epstein argues that both the conservative and progressive modes of constitutional interpretation make fundamental mistakes. On the one hand, he faults conservatives for a narrow-minded originalism; on the other hand, he blames progressives for espousing the idea of the “living Constitution.” As he wrote in his Defining Ideas column at the Hoover Institution, this has led to an overreaching “economic naiveté” and ill-advised anticompetitive measures. He writes that the antidote to both of these flawed ways of thinking is a classical liberal constitutional interpretation. A classical liberal framework, Epstein argues, has already shaped our understanding of certain aspects of the Constitution. One of them is the First Amendment and its protection of gestures under “free speech” and exclusion of acts that encourage violence. Now with this new book, subtitled The Uncertain Quest for Limited Government, he makes the case that, seen through a classical liberal lens, the Constitution provides a more concrete economic blueprint than conservatives or progressives have previously recognized; the judiciary’s blindness to the document’s original emphasis on limited government and greater individual liberties, shown by its willingness to grant the legislative branch too much free rein on economic issues, explains our country’s current political and economic morass. In September, Epstein launched the Classical Liberal Institute at NYU School of Law to study core conceptions of limited government and private property in a wide range of modern contexts including political and corporate governance, taxation, takings, intellectual property, and different forms of regulation.